Water Use in Commerical Buildings – Where Does it all Go? According to the United Nations Environmental Programme, buildings consume one-fifth of the world’s available water – a staggering number when considered. So, what do the architecture and engineering (A/E) firms who design those buildings have to say about water use?A recent study by McGraw-Hill’s Construction sheds light on the subject. Report findings show that A/E firms, contractors and building owners believe that water efficiency is “quickly becoming a higher priority than other aspects of green building such as energy efficiency and waste reduction.” A finding that leads McGraw-Hill to conclude that water efficiency and conservation will become critical components of green design over the next five years. The McGraw-Hill report, titled “Water Use in Buildings”, outlines that 85 percent of those surveyed within the industry believe that water efficiency will be “an extremely important aspect” of green building by 2013. The study looks at building water use for various states across the country, including its most populous state – California. California’s commercial, institutional and industrial sectors (also known as CII) use approximately 2.5 million acre-feet of water a year for example. A similar water study published last month by the Natural Resources Defense Council (NRDC) states that great opportunity for conservation exists, should California adopt several available and achievable measures. The NRDC study, picked up by both GreenBiz and Reuters, outlines that California businesses could save up to 1.3 million acre-feet of water (more than 50%) every year by simply using a combination of existing technologies and more efficient practices. How much water is 1.3 million acre-feet annually? 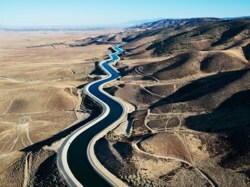 Stated another way, new research shows that it is enough water to meet the needs of Los Angeles, San Diego and San Francisco combined. While the study focuses a great deal on California, it also points out that the same technologies and practices can (and should) be utilized across the country. 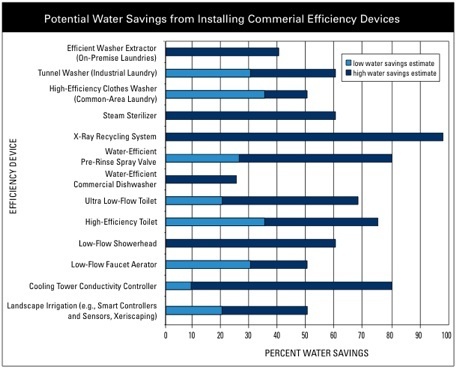 In the brand awareness portion of the study, high-efficiency toilets ranked highest (48% of respondents) followed by water-saving sinks (30%), and waterless urinals (23%).A short list of other available technologies discussed includes low-flow faucet aerators, on-site treatment and smart landscape irrigation.The study explores the motivators, objections and potential obstacles of those businesses consuming water in buildings across the country. For more information about Water Use in Buildings: Achieving Business Performance Benefits through Efficiency, please click here.